Pegram contends the #72 Foremost Insurance Pegram Racing EBR 1190 in AMA Pro SuperBike. Early Career Turned Pro in 1988 and began in Dirt Track racing. Was second in 1991 AMA 600 National Dirt Track Championship. 2013 Finished sixth in the AMA Pro SuperBike standings with five Top 5s, including three podiums. Raced for Foremost Insurance/Pegram Racing Yamaha. 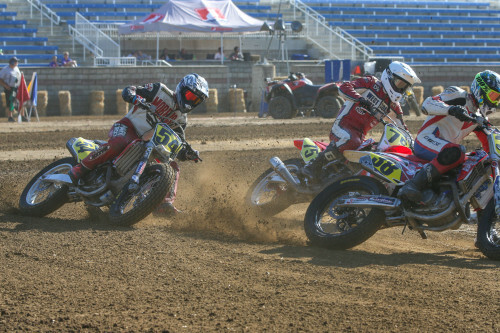 2012 Finished seventh for the second straight year in the AMA Pro National Guard SuperBike point standings. His campaign included 17 top 10 finishes out of 20 starts. His best race of the year came at Daytona International Speedway where he finished fourth. 2011 Finished seventh in the AMA Pro National Guard SuperBike point standings with three Top 5s, only finishing out of the Top 10 twice. Raced for Pegram Racing/Foremost Insurance BMW. 2010 Won the first race at Auto Club Speedway. 2009 Finished fourth in the AMA Pro American SuperBike point standings with three wins - Road America and Topeka (2) - and finished in the top-10 in all but two rounds. Also earned a pole at Topeka. Raced with Foremost Insurance/Pegram Racing Ducati team. 2008 Raced in Formula Xtreme and placed a career-best fourth in the point standings after finishing no lower than eighth all year. Finished a season-best third in three races, including the season-opening Daytona 200. Also finished third at California and Road America. Raced with LeoVince/Foremost Insurance/Pegram Racing Ducati team. 2007 Raced in Formula Xtreme, earning three podium finishes and three additional top-five results. Raced with Leo Vince/Pegram Racing Ducati team. 2006 Raced in AMA Pro American Superbike, earning five top-10 finishes. Raced with Pegram Honda team. 2005 Contested the AMA Pro American Superbike Championship, earning five top-10 finishes. Raced with Hotbodies Racing Honda team. 2004 Raced in the AMA Pro American Superbike Championship with sevenths at California Speedway and Road Atlanta. Raced in Formula Xtreme with a best result of fourth at Mid-Ohio and a fifth finish in the championship. 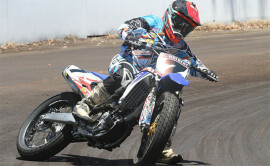 Raced with Triangle Cycle Yamaha team. 2003 Raced a limited AMA Pro American Superbike season with Dream Team Ducati before the team withdrew from the series. Placed third in AMA Pro American Superbike race two at Road America. 2002 Pegram competed in AMA Pro American Superbike and entered select Superstock rounds with a best result of fourth at Daytona. Raced with Hooters Suzuki team. 2001 Year’s best AMA Pro American Superbike result was sixth-place at the Daytona opener. Raced with Competition Accessories Ducati team. 2000 Took his season-best AMA Pro American Superbike finishes of seventh-place at Mid-Ohio and Pikes Peak. Raced with Competition Accessories Ducati team. 1999 Took his first career AMA Pro American Superbike win at Willow Springs. Finished the season with what remains his highest AMA Pro Road Racing ranking to date with fifth place in the standings. Raced with Ferracci Ducati. 1998 Won the 600 SuperSport race at Pikes Peak and climbed the podium at the season finale in Las Vegas. Campaigned the Suzuki TL1000R in AMA Pro American Superbike. Raced for Yoshimura Suzuki. 1997 Raced in 600 SuperSport, finishing on the podium at New Hampshire and Pikes Peak. Finished in the top-10 at seven AMA Pro American Superbike races with a best result of seventh at Phoenix. Rode for Yoshimura Suzuki. 1996 Raced with Ferracci Ducati in AMA Pro American Superbike. Best result was second at Pomona, one of two podium results in the season. Set a new track record to win the pole at Road America. Signed with Yoshimura Suzuki for 1997. 1995 Raced in 600 SuperSport and had six top-10 finishes, including a third at Loudon, his first 600 SuperSport podium finish. Rode for Erion Racing while also running in Dirt Track competition. 1994 Best finish of the season was fourth at Pomona in 600 SuperSport. 1993 Suffered serious injuries in an AMA Pro American Superbike crash at Phoenix, and was forced to sit out most of the season.